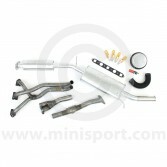 Mini Sport is one of the leading suppliers in Stage 1 Tuning Kits for Classic Mini. 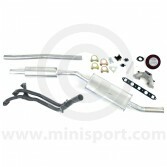 A Stage 1 Tuning Kit is one of the most accessible and worthwhile ways to improve your Minis performance and power, whilst maintaining fuel economy and engine reliability in standard driving conditions. 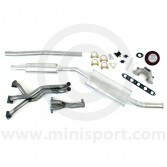 Our specialist range of Stage 1 Tuning Kits are available as complete or half size kits with MPi and SPi editions also available. 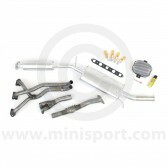 These kits are compatible with all Classic Mini models pre and post 1990 and will improve the performance of all standard carb Mini 850/998/1098/1275cc with HS4 carburetor. 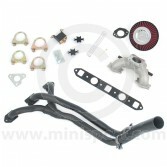 The Mini Sport Stage 1 Tuning Kit includes an inclusive variety of parts to achieve those additional performance attributes – this includes: A Superflow exhaust system, an LCB exhaust Manifold, Alloy Water Heated Inlet Manifold, Exhaust Manifold Gasket, Cone Air Filter, Carburettor Needles, Carburettor Spring and Exhaust System Fitting Kit with comprehensive fitting instructions. 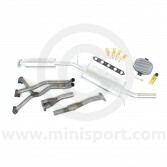 Please take a look at our other range of Exhaust Systems & Parts or alternatively our exclusive range of Engine Tuning Kits from the iconic Cooper Car Company.